Deer Brush is a member of the Buckthorn Family. It appears as a shrub or small tree growing to 13 feet in height. It has grey bark and thin elliptical leaves each with 3 main veins which grow to 2.5 inches in length. 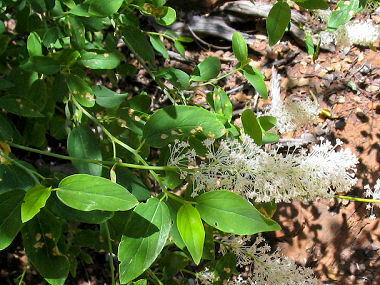 It grows on dry slopes in chapparal and open forests. Deer Brush regenerates by seed, shoot formation from the crown and stem, and also by layering when branches come in contact with soil. As its name implies, it is browsed by deer. 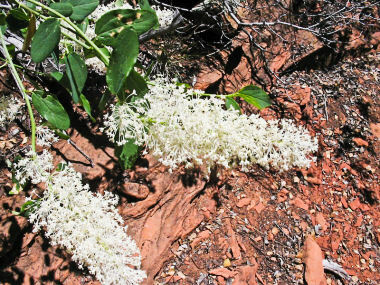 Deer Brush blooms between May - June and produces tiny, white flowers with 5 petals which grow in a cluster to 6 inches in length. Flowers are followed by a sticky fruit capsule which grows to 0.2 inches in diameter; the seed is ejected from the capsule after splitting.